To ask other readers questions about Tales of Terror from the Black Ship, please sign up. I'm still on page 5 of this book and its quite enjoyable. is it good? I will find out. I was drawn to this book by the wonderful Gorey-esque drawings on the cover and once I picked it up, I could not put it down. As the title clearly says, these are tales of terror from the black ship. The stories are told within the framework of a severe storm, an inn perched on the top of a sea cliff, and two ill children left alone who open the door to a stranger. That these children have a penchant for frightening stories is somehow not surprising, nor is the stranger's apparently endless supp I was drawn to this book by the wonderful Gorey-esque drawings on the cover and once I picked it up, I could not put it down. As the title clearly says, these are tales of terror from the black ship. The stories are told within the framework of a severe storm, an inn perched on the top of a sea cliff, and two ill children left alone who open the door to a stranger. That these children have a penchant for frightening stories is somehow not surprising, nor is the stranger's apparently endless supply of such tales. I particularly like that each individual tale can stand on its own, but at the same time, they work together within the overarching framework to slowly reveal the larger story. I had no trouble finding the connection between the stories after the first few, nor was it difficult to figure out where the stranger had come from or who the children were. I suspect that for younger readers, however, these revelations might be more of a surprise. The tales of terror are reminiscent of Edgar Allen Poe, W.W. Jacobs' 'The Monkey's Paw,' Robert Louis Stevenson, and even some aspects of the Sherlock Holmes stories. Chris Priestley does a good job of maintaining suspense throughout the entire book as well as creating tension within the individual stories. For younger readers, it might be well to note that some tales are rather bloody. Not nearly as atmospheric or gripping as Uncle Montague's Tales of Terror, but brilliantly macabre nonetheless. Although the short stories do improve throughout, they're a far cry from the more compelling tales that I know Chris Priestley can write. Worth the read, but the other two books in the trilogy are much better. Another favourite from Priestley, can't wait to read the 3rd one. Il finale è GENIALE. Adorato! Though the individual stories are not as frightening as its prequel nor the ending as satisfying, it still gives you chill and makes you second guess your decision to read it alone late at night. Recommended for both young and mature horror fans! This book has the same structure as Priestley's earlier Uncle Montague's Tales of Terror. After an introductory chapter setting the stage and introducing the main characters, each chapter consists of a gruesome tale and a preamble to the next tale. In this case the setting is an inn standing on a promontory precariously connected to the rest of Cornwall. The characters are the children of the innkeeper, who has left them to fetch a doctor while a terrible storm is raging, and a mysteri 3.5 stars. This book has the same structure as Priestley's earlier Uncle Montague's Tales of Terror. After an introductory chapter setting the stage and introducing the main characters, each chapter consists of a gruesome tale and a preamble to the next tale. In this case the setting is an inn standing on a promontory precariously connected to the rest of Cornwall. The characters are the children of the innkeeper, who has left them to fetch a doctor while a terrible storm is raging, and a mysterious stranger who came knocking on the door asking for shelter. The stranger, a sailor, tells the children many tales of terror to do with the sea and seafaring, to while away the time until the storm abates and the innkeeper returns. My favourites in this collection are "Nature", "The Scrimshaw Imp", "The Black Ship", and the concluding story "Wolfsbane", even though its plot was borrowed from (view spoiler)[ The Others (hide spoiler)]. Since the last three of these are also the last three in the collection, I'm giving the book a half-star extra, for ending on a high. Overall, I enjoyed this collection more than I did the first one. This is the sequel to the wonderful 'Uncle Montague's Tales of Terror' which I read last year. Being a bit of a scaredy cat, this book, which is really a childrens book (age range 9-12 approx), is about as scary as I go without needing to leave the light on at night. It's a collection of short stories told to two children on a dark stormy night by a stranger who needs shelter from the raging storm outside. As in the previous book, some tales are scarier than others .... 'The Scrimshaw Imp', 'Irezu This is the sequel to the wonderful 'Uncle Montague's Tales of Terror' which I read last year. Being a bit of a scaredy cat, this book, which is really a childrens book (age range 9-12 approx), is about as scary as I go without needing to leave the light on at night. As in the previous book, some tales are scarier than others .... 'The Scrimshaw Imp', 'Irezumi' and 'Nature' I found particularly chilling .. and the brilliant 'Wolfsbane' which concluded the tales with an unexpected twist. Some of the stories are more predictable and you can work out what's going to happen pretty easily (but then, it is meant for children) but the whole together make a really chilling and spine tingling collection. Adorei este livro e não sei bem explicar porquê. Apenas adorei. Recomendo muito! Schaurig schön mit einem absolut unerwarteten Ende. Das Buch strotzt nur so vor Phantasie und hat mich völlig in den Bann gezogen. Leicht und schnell zu lesen. Last week the Cornish coast was lashed by storms. I was tucked up at home with a book, with waves outside crashing against the sea wall and being forced up over the promenade and the road. Our garden was soaked by the spray and the downstairs windows got a salt water rinse. It’s a marvellous sight when you’re inside, secure in the knowledge that your home has withstood a multitude of storms over a hundred years and more. And in the pages of my book two children looked out on a similar storm. Ethan a Last week the Cornish coast was lashed by storms. Ethan and Cathy were home alone, in an inn on the edge of a Cornish cliff. They had been sick and their widowed father had set out through the storm to fetch the doctor. After he left they felt better and got up to watch out for his return. But the man who appeared outside was not their father, but a young sailor. Where had he come from? What was he doing out on such a night? While Ethan hesitated Cathy granted the man admission to the inn. And they stuck a bargain. The man, Thackery, would be given refreshment and shelter from the storm, and in exchange he would tell the children stories of the sea. Wonderful stories! Filled with all of the traditional elements of sea stories yet fresh and new. Each one simple,clear and engaging – and holding a striking twist. Favorites? A compelling tale where the ship’s cat plays a central role. The story of two sailors who visit a tattoo parlour in a foreign port with extraordinary consequences. And, for me, the most haunting tale told of a child picked up from a small boat adrift. And as the stories unfold Ethan begins to wonder where his father is and why Thackery has come. Ethan asks questions. Thackery tells no more than he wants to, and deflects attention by offering up more stories. Until the final tale, which explains everything, twisting, not just once, but twice. Everything is executed just perfectly – the words of Chris Priestley and the illustrations of David Roberts. Yes, the format is the same as their previous work, Uncle Montague’s Tales of Terror, but it works. This volume is distinctive enough to stand up in its own right and just that little bit more sophisticated than its predecessor. Perfect reading for the season – and I look forward to the next volume! Non mi aspettavo molto da questo libro (che ammetto, ho comprato per la copertina e le pagine nere XD), mentre in realtà è ben scritto scorrevole. Le varie storie che compongono il romanzo sono TUTTE interessanti, alcune veramente macabre. Il finale è assolutamente geniale e un po' malinconico. Korsanlar , boğularak can verme , deniz yaratıkları beni her zaman korkutmuştur. Priestley'nin bu kitabı da korkularıma tuz biber oldu. Kara Gemi hikayesi beni gerçekten korkuttu , diğer hikayeler de fena değildi. I am not normally a fan of creepy or scary stories but these are great- well written with a few twists. After reading ‘Uncle Montegue’s Tales of Terror’ by Chris Priestley,I was really excited to see ‘Tales of Terror from the Black Ship’ in my local library! I checked it out straightaway read it immediately! 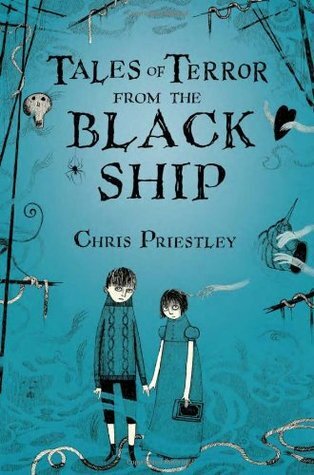 ‘Tales of Terror from the Black Ship’ follows sibling Cathy and Ethan. When the siblings fall ill during a terrible storm their father is forced to leave them and find a doctor. They live in an inn by the sea, and it is not long before a storm drenched sailor comes knocking at the door seeking After reading ‘Uncle Montegue’s Tales of Terror’ by Chris Priestley,I was really excited to see ‘Tales of Terror from the Black Ship’ in my local library! I checked it out straightaway read it immediately! ‘Tales of Terror from the Black Ship’ follows sibling Cathy and Ethan. When the siblings fall ill during a terrible storm their father is forced to leave them and find a doctor. They live in an inn by the sea, and it is not long before a storm drenched sailor comes knocking at the door seeking shelter from the storm. Cathy and Ethan let him in and they find themselves being entertained by his scary and grisly tales – and it is these tales that form most of the book. Once again, Chris Priestley has crafted a gruesomely enjoyable and entertaining collection of scary tales. I found myself forgetting that this was actually a book intended for a teenage audience – I think I would have been more than a little nervous if I had delved into this ten years ago. The tales in this book had more than enough horror, gore and eeriness to keep me engrossed in each tale. And after finishing one of the tales, I can safely say that I will never EVER look at a snail in the same way again! I felt that the link between the stories was a lot stronger in this book than in ‘Uncle Montegue’s Tales of Terror’. I was definitely invested in the original setting with Cathy and Ethan, and found the mystery of who the sailor was rather intriguing. I felt that the book was ended really well – I loved the twist and actually didn’t see it coming at all! I also adored the illustrations (by David Roberts) in this book – they really add to the overall mood and atmosphere of the book, and add a little ‘something’ to each story. Overall, I thoroughly enjoyed ‘Tales of Terror from the Black Ship’ and I highly recommend it to anyone who enjoys collections of scary stories. They have a faint essence of ‘Edgar Allen Poe style’ to them – and don’t worry about them being published for younger readers. I will most definitely be looking out for Chris Priestley’s third book in this style -Tales of Terror from the Tunnel’s mouth. Once again Chris Priestley presents us with a selection of ghostly tales covering a variety of sea-related monsters and frights linked together by an intriguing tale of two sick children waiting for their father to return with the doctor. I enjoyed the previous tale – Uncle Montague’s Tales of Terror (reviewed here), but I definitely preferred these selection of tales. The ongoing theme of nautical terror was a strong link between stories – after all what is scarier than being trapped on a ship Once again Chris Priestley presents us with a selection of ghostly tales covering a variety of sea-related monsters and frights linked together by an intriguing tale of two sick children waiting for their father to return with the doctor. I enjoyed the previous tale – Uncle Montague’s Tales of Terror (reviewed here), but I definitely preferred these selection of tales. The ongoing theme of nautical terror was a strong link between stories – after all what is scarier than being trapped on a ship with a bunch of strangers, surrounded by unfriendly seas for miles? Add a ghostly element, or a mermaid or even sea snails and suddenly you’re feeling ever so glad you’re sat firmly inland with the sea well out of sight reading a book rather than out on the big blue. As is usually the case with short stories, some are more memorable than others – the one about the sea snails definitely sticks with me! This time the link between stories was just as strong as the stories and I was intrigued about the sailor’s background and the children’s home life – how long would their father be gone? It was this linking theme that kept me turning the pages, wanting to know what happens next. Hat mir um einiges besser gefallen als der Vorgänger (Uncle Montague's Tales of Terror). Die Rahmenhandlung war nicht so klischeehaft (Onkel erzählt Gruselgeschichten) und die Kurzgeschichten selbst hatten viel bessere Enden. Der Stil passt zum Buch, wirkt ein wenig altbacken und hat mich daher ab und zu gelangweilt. Die Ideen für die Geschichten sind aber alle ziemlich cool und die Zeichnungen von David Roberts sind wieder absolute Highlights. The horror stories were pretty good and scary by themselves, though as an adult reader, I wanted them to be longer with greater use of descriptions and details. The narrator, a young boy by the name of Ethan, was aggravating. He states the same emotions and reactions over and over and over and at every new chapter, there he is with the same restatement of the same emotions. But as far as scary stories go, I found these to be appropriately scary! The frame for this collection of short stories is rather predictable. The individual tales themselves are better, though the first Uncle Montague book was better. I do wonder why all the short stories and the frame have male central characters. The stories channel Poe, James, and LeFanu. The book is stocked with literary references. Artwork reminds one of Gorey. A collection of very entertaining, and often unpredictable, scary tales set in the world of pirates and mariners. I didn't give it 5 stars only because the final tale - which frames all the others - was unfortunately not as original and surprising as the rest, reminding me instead of (view spoiler)[ the plot of the film "The Others" (hide spoiler)]. So far this is my most favorite book from Tales of Terror series. What can I say.... This book deserves a lot more praise that I can express with my words. This is not so different from the other books of the series in terms of narrative but the ending was definitely a surprise! A must read for those who like horror stories. Quite creepy if predictable. I liked the first book and probably liked this one more. Some of the stories were quite eerie and clever and others I have heard before but the author puts a new spin in many of them with the seafaring theme. I particularly enjoyed the snail story! Not a challenging book but light, entertaining and a bit disturbing.